The details on a crucifix or rosary help establish a date. Antique crucifixes are usually part of rosaries, used for prayer in the Catholic Church. These beautiful, old crosses are a fascinating look at the history of the church throughout the world. They have been an important symbol of faith for generations and you can find them depicted on everything from portraits of historic figures to vintage photographs of soldiers in uniform. A crucifix, or cross, is a geometric figure consisting of two perpendicular lines, one dividing the other. Generally this figure is termed a crucifix when there is a representation of the martyred body of Christ on the cross. The crucifix is first recorded as being used in the fifth century. Prior to this time Christians used the symbol of a lamb to represent Him. Scholars believe that this was because the cross was still being used as a method of execution and the early followers of Christ did not want to associate Him with this ignoble death. It wasn't until the Middle Ages that craftsmen began to create intricate crucifixes. Prior to the 1200s Christ was crafted on the cross with open eyes and little sign of suffering. The artists' emphasis was on His resurrection rather than His death. Slowly this changed and within the next one hundred years the represented body of Christ on the crucifix became twisted in agony and bloody. Part of the reason for this was the split between the Eastern Orthodox Church and the Catholic Church, with its doctrinal emphasis on suffering in order to control the sin nature of man. By the Renaissance the image of Christ had changed again. He was still on the cross with head bowed, but rather than agony He was depicted as being calm and serene. In the 16th century the Protestant Reformation was in full swing. The crucifix (with the image of Christ) and the cross (without the image of Christ) fell out of favor. In fact, these beloved symbols were banned in all new Protestant Churches and called symbols of idolatry. In the past two centuries the cross has reappeared in the Protestant Church, but only the cross. Crucifixes are associated with Catholicism. Crosses are common symbols in many religions and cultures but the crucifix is symbolic to Christians alone. 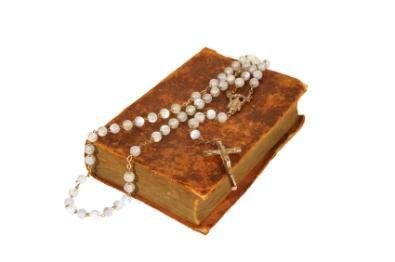 The rosary is not only a Christian item. Many eastern religions have used bead, knotted, and other types of necklaces to count off prayers and religious memorizations. Early Christians counted 150 beads for the 150 Psalms. Some church scholars and historians think that the tradition came to the church from Muslim or Buddhist monks. Others point out that the Jews had a counting system and that would have naturally been adopted by the early Christians, many of whom had been Jews before converting. Condition: As with any antique the condition will have a large effect on the value. Look for nicks and breaks, as well as areas where the item may have been soldered or repaired. Check the figure of Christ to see if it looks like it is original to the piece or was replaced later on. Detail: While each era with have a different amount of detail, some crucifixes will be better examples of the time period than others. Look for quality of materials and craftsmanship in the antique crucifixes that you consider. Age: It is sometimes difficult to date crucifixes. Consider the materials, the details, and the way the item is made when you try to place the item in a particular time period. If you are told that the crucifix you are interested in is over one hundred years old and you see a stamp on the back that says Made in China it is probably a good indication that you are being duped. Desirability: Is there something in particular that makes this piece stand out? Is it unique in some way? It could be an unusual design, a rare material, or there may be some provenance that makes it special. A crucifix that belonged to a well known historic personality will obviously be more valuable than one that nothing is known about. If you are looking for more information and detailed images of antique crucifixes through the centuries be sure to check out the Rosary Workshop Museum. This site has a fantastic collection of crucifixes and rosaries; lots of images, and detailed descriptions to help you increase your knowledge about these beautiful, religious symbols.